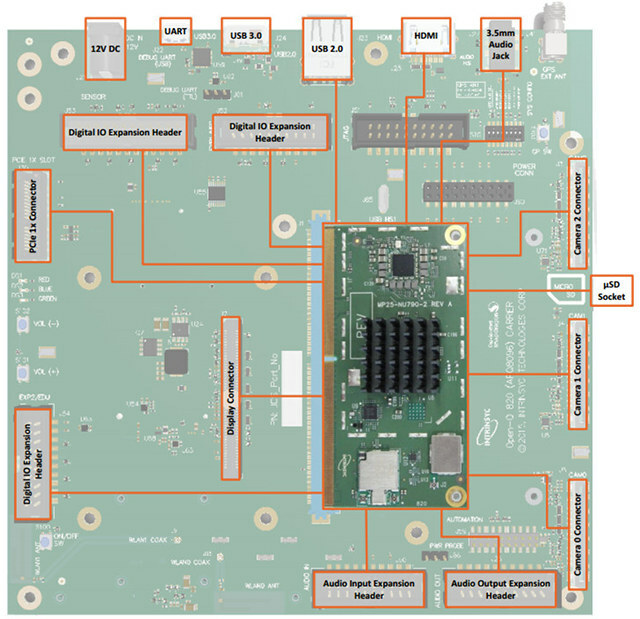 While there’s already an healthy choice of ARMv8 development board such as LeMaker Hikey, or Qualcomm DragonBoard 410c, all those platforms are based on the lower end Cortex A53 64-bit ARM core, and ARM Cortex A57, let alone Cortex A72, boards are much more difficult to find, as they are much pricier and/or have limited availability. 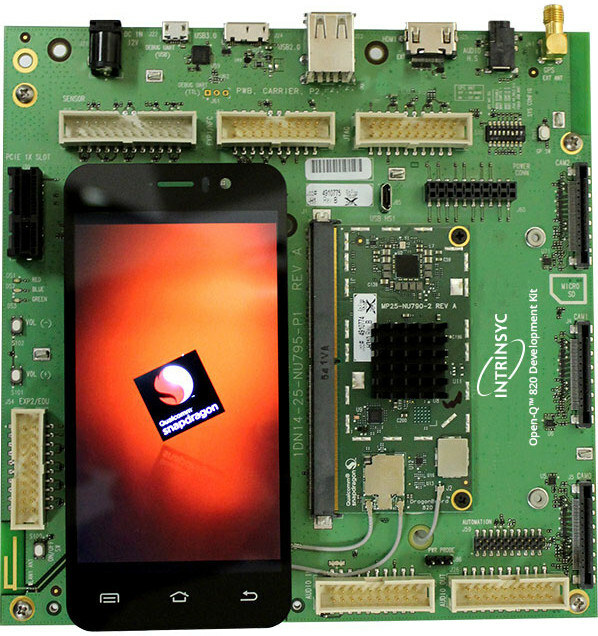 Intrinsyc may have released the first (somewhat) affordable and accessible Cortex-A72-class development board with Open-Q 820 development kit comprised of a SoM and a baseboard, as well as smartphone and tablet mobile development platforms (MDPs) based on Qualcomm Snapdragon 820 quad core Kryo processor. While Kryo is a custom ARMv8 designed by Qualcomm, and not exactly a Cortex A72 core, both have similar performance, as shown in Snapdragon 820 Antutu and Kirin 950 Antutu results. SoC – Qualcomm Snapdragon 820 quad core Kryo cores with 2x cores @ up to 2.2GHz, and 2x cores @ up to 1.6GHz, an Adreno 530GPU, an Hexagon 680 DSP, and a 14-bit Spectra ISP. USB – 1x micro USB 3.0 host, 1x micro USB 2.0 OTG, 2x USB 2.0 host ports. The company provides support for Android 6.0 Marshmallow for the board. Documentation is quite limited right now with only product briefs for the board and the SoM, but the company claims users will receive product documentation and access to complimentary tools and software updates. Beside Open-Q 820 development kit, Intrinsyc also offers a smartphone MDP with a 6.2″ QHD display, and a tablet MDP with a 10.1″ 4K UHD (3840 × 2160) multi-touch display. Both will support 802.11ac with Qualcomm MU | EFX MU-MIMO technology, Blueooth 4.1, USB 3.0, and Qualcomm IZat location service. The tablet MDP has also has tri-band support, and supports multi-gigabit 802.11ad (11ad) Wi-Fi. Intrinsyc Open-Q 820 development kit appears to be available now for $599 plus tax and shipping, the Tablet MDP for $999, and the smartphone MDP will be $799, but it’s not quite ready for sale yet, and shipping is scheduled for December 31, 2015. Well this is more like a developer thing, i’ll rather wait for the end. product.